Probably no name on the Grid has become as linked to machinima as Chantal Harvey. Involved in noted film events such as the 48 Hour Film Project and the Month of Machinima, she has become well known in Second Life and elsewhere. Recently, I had a chance to interview her at one of her machinima sets. Bixyl Shuftan: Pleased to meet you again, Chantal ... a utility belt? Chantal Harvey: I wish I had it in real-life. It has everything a girl needs. Hee-hee. So, what are your questions? 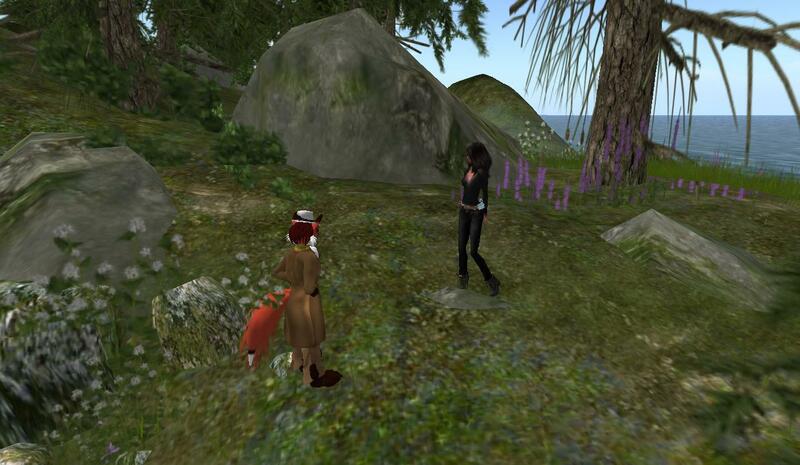 Bixyl Shuftan: Well, how did you first find out about Second Life? Chantal Harvey: Oh, there was a Dutch man on tv, a writer, who wrote a book about his experience as a woman, in Second Life. It made me curious. I was head of a TV station back then, and pretty stressy. I found SL relaxed me a lot. I started dancing and socializing, and loved it. I became a host for the famous TJ Ice club, entertaining people, silly and fun. Chantal Harvey: Yes! That club, is (now) no dance island. We got a message that the TJ Ice club would suddenly close at midnight, and I wanted to preserve it, film it, to have a memory of it. Second Life still had a inside the viewer camera, back then. That was my first machinima. And I never stopped. Bixyl Shuftan: What did you work on after the first? Chantal Harvey: Hmmm. The SL Love Parade. The inworld camera was disabled by that time, so i filmed that with 3 real-life camera's, pointed at my computer screen. (laughter) I have a photo of that, that my husband took . By that time he thought I’d gone mad. Chantal Harvey: No, he knows me, hee-hee. I was doing a lot of real-life TV work, and he loved it that I found something that made me relax. And then i started filming. I guess it is in my blood. He is very proud of what i do, and comes with me to conferences and festivals. Bixyl Shuftan: Has he ever appeared in your SL machinimas. We went to Paris last week, the Atopic Machinima festival invited me. Bixyl Shuftan: That's very interesting. What happened there, if you don't mind sharing? Chantal Harvey: Yes for sure. MMIF is doing well too. Bixyl Shuftan: What is "MMIF" short for? Chantal Harvey: my machinima festival, MaMachinima International Festival, in Amsterdam, real-life. Chantal Harvey: Paris had a jury selection of 26 films, 2 of them were mine. MMIF had 74 films. It ran for 2 nights, this year. Bixyl Shuftan: 74? That's a lot, how many people were involved? Chantal Harvey: Well, 74 filmers, as they all could submit only one film. Then six presenters from different communities. And the tech people, and LEA theater was used for it, which is on 4 sims. And my friend, Ze Moo. He runs the real life festival. He did a grand job. Bixyl Shuftan: What were some of the most noted machinimas at both festivals? Chantal Harvey: At MMIF, “Dear Fairy” by Tom Jantol, and “Little Red Riding Hood” by Toxic Menges. Ar Atopic, I really liked the one that became second, Yann Weissgerber 's film, I loved it best. Zardoz was the winning film, by KingRabbit. My MMIF is not about winners, all are equal. That is why is is such a celebration. People show the film they are most proud of and all are welcome. Bixyl Shuftan: Of the machinimas that you've done, which is your favorite? Chantal Harvey: Hmmm. My last one, a thirty second advertisement for the Superbowl. It has a dragon starring. And I love the Two AM one still, a lot. Bixyl Shuftan: A new adventure? Chantal Harvey: Yes, that’s him. I asked him to be head of jury for the 48 hour film project machinima, which i produce, the real-life contest that involves machinima. We started working together, and formed Scissores, a film production company http://scissores.com . We make real time animation, and childrens e-books, working on one right now. Bixyl Shuftan: It's going to be in the Superbowl? Chantal Harvey: well 1500 films were entered. There will be five finalist, in January. Then, voting. But you never know, the filk is pretty good! It depends on the jury. Working with Tony is all i dreamt of. I worked so hard for four years. It all comes together now. To think that a Hollywood man wants to work with me - woo! Bixyl Shuftan: Sounds like everything's going perfectly. Chantal Harvey: It’s still fun, and that’s important. Bixyl Shuftan: Can you tell me what your and his plans are for Scissors ? Chantal Harvey: Yes, we are doing projects, using real time animation. And we’re preparing our first ebook, using machinima! Chantal Harvey: We have a few things we work on that are very high profile, rea-lifel projects. Bixyl Shuftan: Oh? What can you say about them? Chantal Harvey: Hee-hee, nothing yet. Bixyl Shuftan: Do you have any advice for those wanting to get into machinima? Chantal Harvey: Yes, come to Machinima Mondays! We meet weekly. Join the group, and we are a freindly helping group. We have a Facebook page too. We come and discuss machinima, and all are friendly. It’s important to have a helping hand, when you start, and I advise people to have fun, and experiment. It was at this point the interview came to a close. But unlike most interviews, we didn’t go our seperate ways just yet. Chantal had gotten a TP to an art event and invited me to go with her, and event I’ll be writing about soon. Chantal has a number of websites. These include MaMachinima at http://mamachinima.eu/, MMIF at http://mmif.wordpress.com/ , and Scissores at http://scissores.com/ .